Business acceptance practices have become more complex and strategic over the past several years as departments have evolved from back office, risk management functions to vital, strategic partners to the organizations they support. 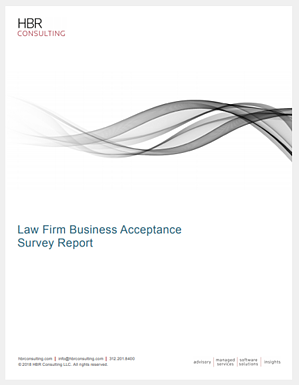 Law firms that have invested early to strengthen business acceptance activities are adding value in the form of better data collection and analysis, increased business development opportunities and the ability to better scale their support for increasingly global firms. The evolving role of people, process and technology. For each of these topics, we discuss what firms have done to expand the adoption of best practices and where we see changes in the way firms approach the intake process. Finally, we review future opportunities for the business acceptance function to contribute value to the firm.